book/paper, acrylic, vinyl, Arduino, motion sensor, MP3 player, light dependent resistor, speakers, and LEDs. 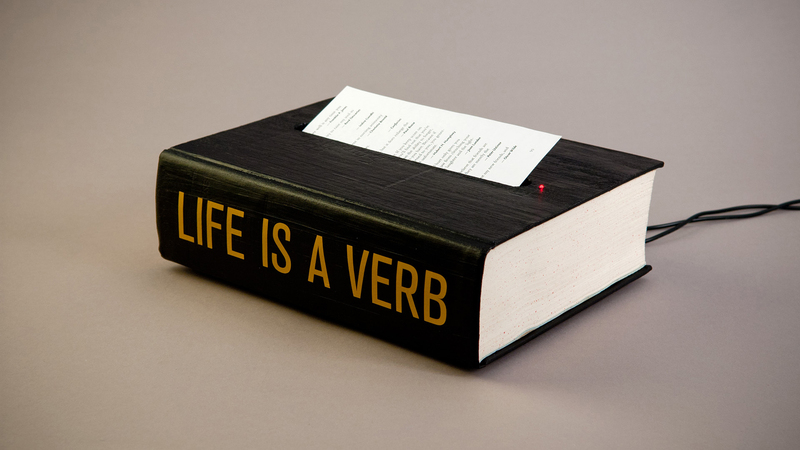 Maverick writer Charlotte Perkins Gilman once wrote that “life is a verb, not a noun.” It is a sentiment echoed in this interactive audio sculptural book. Life takes action, mindfulness, and intention. All these come from within. At a time when the notion of life is located in an uncertain and ever-changing environment, while we are occupied by everyday trivia and surrounded by a fast speed society, wouldn’t the wisdom of the ages bring us inner peace and wonder, and nurture our internal lives? Inspired by Passage Meditation (the method of meditating on a text passage) and painter René Magritte, this project merges a book (the symbolic form of knowledge) with a tissue box (a daily mundane object). This hybrid book creates a new meaning and function: to inspire and deliver wisdom words for daily life. Combining digital and analog techniques, this project transforms a traditional printed book into an interactive audio sculptural book, which meets the exhibition theme “Altered Books: Digital Interventions”. More than 200 proverbs collected from history were recorded by four voice artists, from Socrates to Einstein, from Lao-tzu to Eleanor Roosevelt, from Dalai Lama to Emily Dickinson. 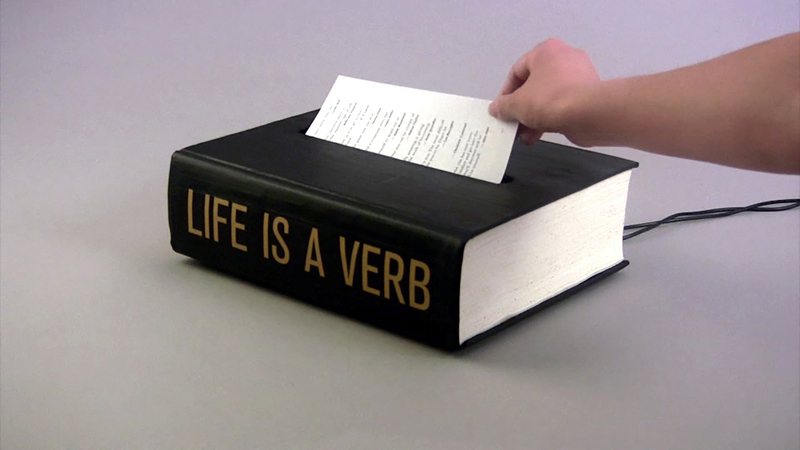 When a page is pulled away from the book, the motion sensor inside the book actives an MP3 player, which releases the audio proverbs for 20 seconds. On the pages are printed witty proverbs for gallery display. A LED placed on the book front cover indicates the on or off state of the MP3 player installed inside the book (when the player is on, the LED light is on).